In many parts of the country, fall means changing foliage, shorter days, and enjoying outdoor activities like football games and apple and pumpkin picking. The change in seasons can also bring more cars and buses on the roads as kids return to school, and more paving and construction as cities and towns try to wrap up these projects before the onset of winter weather. And with hurricane season extending through the end of November, flooding or wind-blown debris can cause road closures and access restrictions. From bridge repair and hazardous road conditions to seasonal events, there are countless projects and occasions that require the use of temporary or semi-permanent signage. Whether the situation calls for hourly, daily or longer-term use, portable traffic sign bases and poles can provide the visibility, control and security needed to keep workers, pedestrians and motorists informed and safe. The biggest advantage of portable sign bases with wheels is they allow you to place signage where you need it, when you need it. They are heavy enough to provide stability and wind resistance, yet light enough to easily tip and roll. This means you can place them where they are highly visible to provide direction or improved safety, and remove them when a project or event is done. You can also save money by reusing portable sign bases and poles. Simply change the signage or move the existing sign to a new job or location. 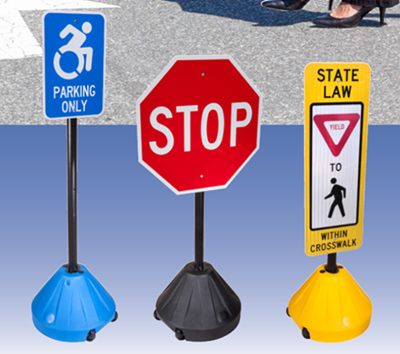 Traffic Safety Direct’s Plastic Tip 'N Roll Portable Sign Bases and Poles set the standard for traffic, parking and safety signs with their sleek look, compact footprint, user friendliness, durability and affordability. These portable sign bases feature built-in wheels designed to roll on most surfaces, making it easy to move them without lifting or carrying. This makes them the perfect choice for any number of semi-permanent signage uses, including road maintenance, construction sites, intersections and pedestrian crosswalks, parking lots, offices, schools and stadiums. Our compact, low profile Portable Pole 2 Sign Base has atechnopolymer 18" diameter base that is durable and never rusts. You can draw extra attention to your sign with one of our four colored bases: Black, Blue, Yellow and Red. Choose from 48" or 58" poles made of enhanced PVC that won't crack in the cold. Poles are pre-drilled with 6 holes to accommodate signs from 12" x 18" to 24" x 30". Looking for a Larger Post Size? When your sign needs to be seen, size matters. Our Portable Pole 3 Plastic Sign Base and Pole has a larger footprint that provides greater stability for taller poles and larger signs. The heavy-duty 24" rolling sign base and 72" post accommodate sign panels from 9" x 12" to 24" x 24" and 12" x 36". Like our smaller version, the Portable Pole 3 features a clean design that looks great in every location, inside and outside. Both of these wheeled portable sign bases and poles are easy to assemble: just insert the pole, tighten the security bolt and mount the sign. Pair them with our stock parking and traffic signs (sold separately) or custom signs we can create for you. 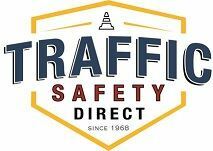 This fall, why not let Traffic Safety Direct handle all of your signage needs? For more information, contact us via email or call give us a call at 888-260-3246.